Long before Dr. Fingal Flahertie O'Reilly came to the colourful Irish village of Ballybucklebo, young Surgeon-lieutenant O'Reilly answered the call of duty to serve in World War II. Fingal just wants to marry his beloved Deirdre and live happily ever after. First he must hone his skills at a British naval hospital before reporting back to the HMS Warspite, where, as a ship's doctor, he faces danger upon the high seas. With German bombers a constant threat, the future has never been more uncertain, but Fingal and Deirdre are determined to make a life together . . . no matter what may lie ahead. Decades later, the war is long over, and O'Reilly is content to mend the bodies and souls of his patients in Ballybucklebo, but there are still changes and challenges aplenty. A difficult pregnancy, as well as an old colleague badly in denial concerning his own serious medical condition, tests O'Reilly and his young partner, Barry Laverty. But even with all that occupies him in the present, can O'Reilly ever truly let go of the ghosts from his past? 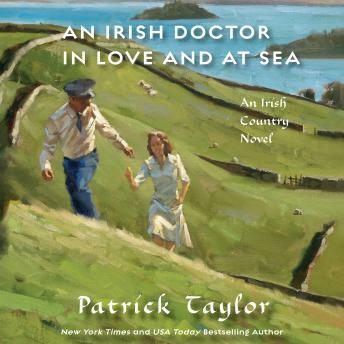 Shifting effortlessly between two singular eras, bestselling author Patrick Taylor continues the story of O'Reilly's wartime experiences, while vividly bringing the daily joys and struggles of Ballybucklebo to life once more in An Irish Doctor in Love and at Sea.